Unfortunately, not every story has a happy ending. Today’s post is about a child named John (case number 9825), who died of tuberculosis at the age of ten. John came from Lambeth in South London. He was an orphan. John’s father had died when John was five years old and John’s mother had died when John was eight; both had succumbed to tuberculosis. This left John in the care of his grandmother, a retired school teacher who appeared to have little money to look after him, and so, shortly after the death of his mother, application was made for John to enter the care of The Children’s Society (then known as the Waifs and Strays Society). In 1903, John (aged eight) and his brother Reginald (aged six) entered a receiving home in Byfleet, Surrey, and were quickly transferred to Messing Cottage Home in Kelvedon, Essex. Looking through John’s case file, the next we hear of him is in April 1905. 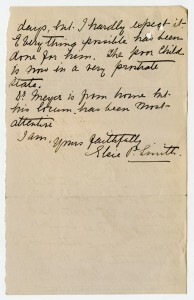 A letter from the Messing Home states that John had been ‘ailing’ and that he had been treated with cod liver oil. Further letters say that John had been under the care of a doctor and was staying in a foster home nearby; this was presumably to quarantine him from the other children in the Messing Home to prevent any disease from spreading. It was thought best for John to be transferred to the Waifs and Strays Society’s Nayworth Cottage Home in Hurstpierpoint, Sussex. This home was a convalescent home on the South Coast and it was hoped that the change in atmosphere and the extra care John would receive there would help him to recover. 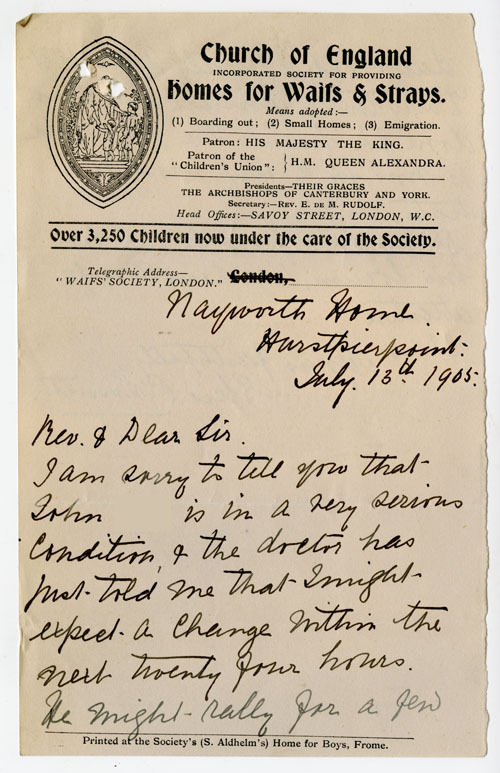 When John arrived at the Nayworth Home in May 1905, he was described as being ‘undoubtedly tubercular, he has a bad cough & seems very weak & emaciated‘. He was prescribed port wine, brandy and ‘a very generous diet‘ in the hopes of building up his strength. We also learn that the Matron of the home had taken it upon herself to nurse him. days, but I hardly expect it. 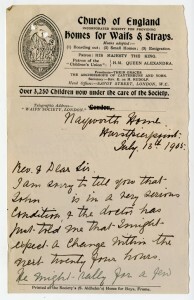 The next item in the case file is a telegram from the Nayworth Home, 14 July 1905, saying that John died at 10:30 that morning. He was ten years old. 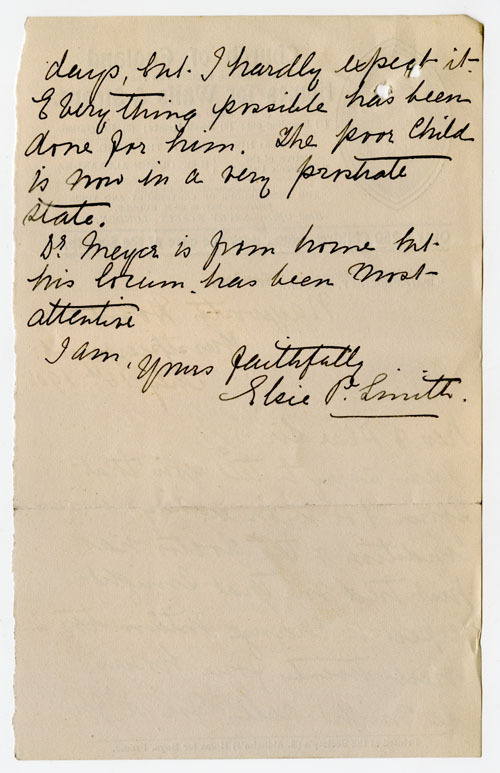 A further death certificate confirms that John died of phthisis (an old term for tuberculosis) and the remaining correspondence in the file relates to arrangements for his funeral. John’s story is sad but was not, I am sorry to say, an uncommon one. The number of children suffering from tuberculosis was high in the early 20th Century, and prior to the discovery of antibiotics to combat it, the disease was often fatal. Of all the case files catalogued so far, 347 relate to children who had tuberculosis, and 133 of those children died while in the care of the Waifs and Strays Society. Doubtless more instances of tuberculosis will appear as more case files are catalogued. The large amount of case files that mention the disease means that they make a very valuable source for research. It would be worth looking to see how the different cases compare with each other. Did children with tuberculosis often come from families where the parents had died of the disease, as had John’s, and was this related to their living conditions? How did different treatments for the disease compare with each other? In 1905, it was thought best to give John cod liver oil, port wine, brandy, a good diet, and fresh sea air. Would these still be prescribed in earlier or later cases? A study of the case files could reveal the answer. This entry was posted in Unexplored Riches in Medical History and tagged Case files, tuberculosis by Janine Stanford. Bookmark the permalink. Indeed, the prevalence of Consumption and/or Tuberculosis had a vast industry of Convalescent homes operating all of the British Isles. Many of the structures built for the purpose were wonderfully thought out with open-air verandas or large picture windows that could be flung open during clement opportune seasons where ‘fresh air’ was understood to be the key for patients who, otherwise, suffered smoke-stacked urban industrial foul aired environments. If Convalescent homes do not have an historical archive (many of the buildings, if altered far from their original intent, still up and running as hotels, private residences or homes for the elderly) they deserve such for the part they play in the history of British institutional medicine and care. Thanks for the insights. I think a number of The Children’s Society’s homes for disabled children had large open-air verandas too. See this image for an example. A lot of the children in these homes were suffering from tubercular diseases of the joints or from rickets, which is presumably why the fresh air and exposure to sunlight was encouraged.